Give a radiant touch to your whole look with Nykaa’s So Matte! Mini Lipstick collection. Experience the same plush, pigment rich formula in Mini Version so it becomes a staple in your bag! The formulation delivers flawless coverage and assures precision application for a perfectly contoured pout! The creamy formula gives your lips a great matte finish!! Up the ante with a sophisticated finishing touch to set off those glamorous evenings! Subtle shades to enhance your natural lip color. The moisture rich Vitamin E extract assures soft, healthy, natural lip shade to ensure your lips stays matte-smooth all day! The creamy texture gives a smooth consistency to your lips.So Make these super affordable lip shades yours and rave about shades all day! 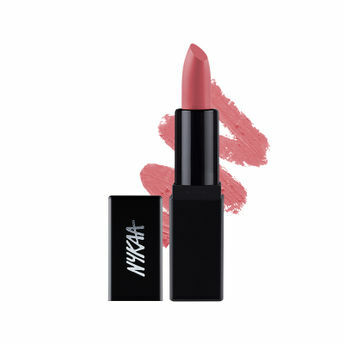 Alternatively, you can also find many more products from the Nykaa So Matte! Mini Lipstick range.